Born in Atlanta in 1957, Tinsley Ellis grew up in south Florida, where at age seven, he first picked up the guitar and absorbed the blues of British invasion groups like The Yardbirds, Cream, The Rolling Stones and The Animals. Digging deeper into the heart of the music, he came under the direct influence of the original masters- Freddy King, B.B. King, Otis Rush, Albert King and Magic Sam- and spent hours perfecting their licks. By 1975 Ellis was back in Atlanta and ready to begin his professional career in music. He was soon gigging with the Alley Cats, a gritty bar outfit that included Preston Hubbard, who later joined the Fabulous Thunderbirds. In 1981 he formed The Heartfixers with veteran blues singer and harpist "Chicago" Bob Nelson, a group that instantly became the region's most popular blues act. After the band's self-titled debut on Southland Records, The Heartfixers signed with Landslide Records, which released the critically acclaimed Live At The Moonshadow. 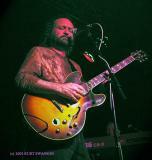 "Tinsley Ellis is a legitimate guitar hero," raved The Washington Post, and Ellis' national stature began to take hold. When Nelson left The Heartfixers in 1983, Ellis assumed vocal chores and led the band through two additional Landslide releases: Cool On It and Tore Up with blues shouter Nappy Brown, which Living Blues called "torrid . . . one of the best discs of the decade." When are you comingback out to Steamboat Springs to Play.